The photograph above shows one of our galleries with standard specification machining. The original housing relied on a close tolerance fit between the oil scroll dynamo drive fork and the housing although this was never an ideal arrangement and was prone to allowing oil seepage onto the dynamo housing. This casting can be supplied in standard factory form or alternatively, we can incorporate a machined recess to fit a secondary lip seal which we can also supply. This product is not offered elsewhere. 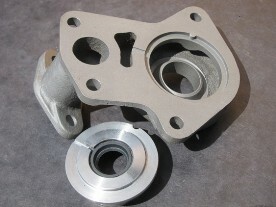 The oil seal insert housings are precision CNC machined and are supplied complete with seals. These are suitable for all MMM models. The dowel locator position on the outer circumference has been deliberately omitted leaving the enthusiast to file to the correct dowel locator position so the oil groove can line up. 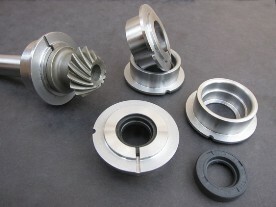 These parts complement the vertical drive pinions and camshaft gears that are also in stock.